Sometimes, wanting to do something is just not enough. Sometimes, what you wish to do and what your brain is actually doing are different things, fighting to take control over you. That’s exactly what happens to many people who get to know GTD. They understand the methodology and the benefits it can bring to their lives, and however, they fail again and again when they try to actually use it. They want to, but the can’t. In each person, it’s as if there were actually two people, acting in different levels: A conscious mind, which we have under control most of the time, and an subconscious mind, which is usually beyond our control. Both parts are in constant struggle. Every time you want to do something, your brain gets instructions from both parts, and these instructions are often contradictory. The subconscious mind usually generates instructions that, even if they were useful two thousand years ago, nowadays probably will go against your best interest, because what moves the subconscious mind are fears and desires related to emotions such as love or apprehension, and not reason. However, the subconscious mind is also what usually causes inspiration and ideas. Those moments full of creativity when you’re completely relaxed (haven’t you ever had a great idea while you were showering?) also come from this part of you. Habits are one of the best tools in your brain. They are so ingrained in your unconscious that are practically intuitive. They allow you to do things almost automatically, without any effort. Good habits are the ones that let you do what your conscious mind — your upper-level you — wants to do. 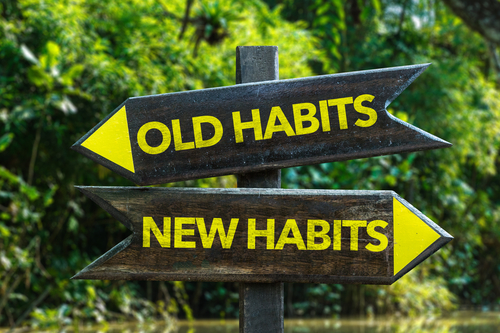 Bad habits are the ones that are controlled by your subconscious mind — your lower-level you — , and get in the way of what your upper-level you wants to achieve. If you understand how habits work, over time you can create a set of good habits that will lead you to do what you really want. Habits are created out of repetition, they’re basically the natural inertia to keep doing what you have “always” been doing. A London’s University College study, in which 96 people had to choose and adopt a new healthy behaviour, generated adoption times between 18 and 254 days, which tells us that success depends a lot on the habit, the person, the perseverance and interest in the outcome. What can’t be argued is this: You might need more or less time, but if you persevere in these three simple habits you’ll make GTD work for you.